The port of Walvis Bay in the Erongo Region is the at the start and the end of four transport corridors, serving as a transport hub for regional and international trade between Southern African Development Community (SADC) countries, Europe, the Americas, and the rest of the world. Namport manages the Walvis Bay harbour as well as the harbour of Lüderitz, on the southern Namibia coast. The Walvis Bay Corridor Group, a public-private partnership, promotes the utilization of the transport corridors. 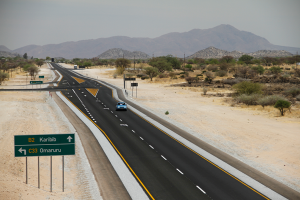 The Trans-Kalahari Corridor is a tarred road linking Walvis Bay via Windhoek over 1,900 km with Botswana and Gauteng Province in South Africa. A railway line connects Walvis Bay via Windhoek with Gobabis, where goods can be transshipped further by road to Lobatse in Botswana. The Maputo Corridor on the east coast of Africa extends the Trans Kalahari Corridor, forming a transport corridor over the breadth of Southern Africa. The Trans-Caprivi Corridor links Walvis Bay with Zambia, the southern Democratic Republic of Congo (DRC) and Zimbabwe. The road of this corridor runs easterly to central Namibia, then north and then easterly via the Caprivi Region to link up with Zambia via the Katima Mulilo Bridge. The corridor stretches over 2,500 km, and is supported by a railway line between Walvis Bay and Grootfontein, with transhipment facilities. The railway line resumes in Livingstone, Zambia. The Trans-Cunene Corridor links the Port of Walvis Bay with southern Angola up to Lubango, over a distance of 1,600 km. The Corridor road infrastructure is supported by the northern railway line, which presently extends from the Port of Walvis Bay to Ondangwa, with a further planned extension to the border post of Oshikango. Cape Province of South Africa. Walvis Bay is also connected by railroad via Windhoek with South Africa. can handle bulk, containerised, frozen and dry cargo. The port is further supported by the Walvis Bay International Airport, which was recently upgraded by the Namibia Airports Company to accommodate the biggest airliners and transport planes. From here fresh fish can be flown directly to countries such as in Europe. NamPower is the national power utility of Namibia, specialising in the generation and transmission of electricity. 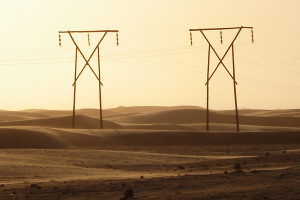 The Erongo Region is connected to the well-developed national power grid. The Erongo Regional Electrical Distributor is tasked with the supply and distribution of electricity to the region, combining the electricity distribution departments of the Local Authorities, Regional Councils and NamPower. NamPower’s main sources of power are the thermal, coal-fired Van Eck Power Station outside Windhoek, the hydroelectric plant at the Ruacana Falls in the Kunene Region, and the standby diesel-driven Paratus Power Station at Walvis Bay. A coal-fired station is planned for Walvis Bay. Namwater is the national entity that supplies water in bulk to industries, municipalities and the Directorate of Rural Water Supply in the Ministry of Agriculture, Water and Forestry. The latter supplies water to rural communities. NamWater extracts water from the large Kuiseb river aquifers, which is then pumped to a number of reservoirs that provide water to Walvis Bay, Swakopmund and the mining industry. A desalination plant was erected by private initiative just north of Wlotzasbaken on the coast to supply a Uranium mine with water. Namwater has been considering another desalination plant along the coast. Telecom Namibia, the national communications operator, serves more than 145,360 customers, while two cellphone operators, MTC and Cell One, have more than two million users. Various private companies in Namibia provide Internet and Communication Technology services.